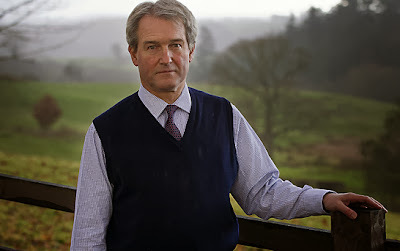 Since I was given the opportunity to respond to his inane remarks about fracking back in the summer I have taken an increasing interest in the escapades of Environment Secretary Owen Paterson, whose suggestion that his failed badger cull was the fault of the badgers has brought him greater public attention recently. When asked for that comment I had just eaten a particularly dreadful railway burger and so was feeling irritated before I even read his remarks, hence my suggestion that he was only a so-called environment secretary. With the benefit of some reflection I actually feel my comment was well aimed, since the problem I have with Paterson is about what he thinks the environment means and therefore what it means to be the minister for it. Paterson is clearly taking a definition of ‘environment’ that is diametrically opposed to my own and one that exposes him out as a classic representative of the man-in-dominion approach to the natural world. This comes easily to those who have grown up owning large stretches of countryside and seeing it as a playground for them to cavort in and a place to shoot any creatures that might make their home there. A Green environment secretary would take the perspective of humans as part of that environment not an external, colonising force. Shifting from the view of land belonging to humans to the view of people belonging to the land was an important step in my ecological evolution. Paterson’s increasingly strident attacks on the opponents of fracking, those who attempt to defend badgers, and to protect our environment against genetically modified crops have made it clear that Patterson has been Crosbied. Lynton Crosby's main influence on the government has been to persuade them to abandon any pretence of basing policy on scientific evidence or even to debate with their opponents at all. Instead the strategy is to go for full frontal assault on people who do not share their view, calling them wicked and shameful and suggesting that they revel in childhood blindness or the slow death of soft fluffy animals. Paterson was clearly chosen for this role because of his fondness for seeing the environment as something to be exploited and a ‘wholly owned subsidiary’ of UK plc, rather than understanding that the economy is entirely dependent on the environment, as Herman Dally suggested an ecological approach to economics requires. Hence the NPPF (the coalition government's planning policy), with its presumption in favour of growth and an undebated and unrestrained support for fracking no matter what the environmental and social cost. Paterson's suggestion that the badgers moved the goalposts was greeted with hilarity but is in fact one of his more sensible suggestions. If he could only begin to see parts of non-human nature as having agency and deserving respect we might see some improvement in his hitherto dire performance in protecting the environment.